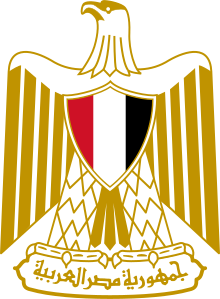 Egypt (Arabic: مِصر‎), officially the Arab Republic of Egypt, is a country mainly in North Africa, with the Sinai Peninsula forming a land bridge in Southwest Asia. Egypt is one of the most populous countries in Africa and the Middle East. The great majority of its estimated 80 million people live near the banks of the Nile River, in an area of about 40,000 square kilometers (15,000 sq mi), where the only arable land is found. George W. Bush, Freedom and Fear Are at War (20 September 2001). Like startled giants by Nile's famous flood. Lord Byron, The Age of Bronze (1823), V; reported in Hoyt's New Cyclopedia Of Practical Quotations (1922), p. 218. Al Conway, a U.S. trader and consultant for Cascade Commodity Consulting Company, quoted on CNBC (February 9, 2016), "UPDATE 2-Bunge challenges Egypt over rejected French wheat cargo"
Exodus, XII. 36; reported in Hoyt's New Cyclopedia Of Practical Quotations (1922), p. 218. The Egyptian scales of justice are not reversible. There is no justice in Egypt. No reason. Logic committed suicide a while ago. Egypt went crazy. Egypt is ruled by a bunch of lunatics. Mohammed Abu Hurira, as quoted in "Four-year-old sentenced to life in prison for murder in Egypt" (19 February 2016), by Caroline Mortimer, The Independent. We are good fighters but lousy builders. Our last piece of original architecture was during ancient Egypt. What are we known for now? Michael Matogo, The Burden of a Great Legacy (4 October 2001). William Shakespeare, Antony and Cleopatra (1600s), Act IV, scene 15, line 18; reported in Hoyt's New Cyclopedia Of Practical Quotations (1922), p. 218.